Coastal GasLink is a proposed 670-kilometre natural gas pipeline project between the fracking fields near Dawson Creek and a liquid natural gas (LNG) facility in the port of Kitimat. This pipeline will be owned and operated by TC Energy (formerly known as TransCanada). The gas will be liquified in Kitimat for export to Asia. Both the governments of British Columbia and Canada supported the project through incentives such as tax breaks and tariff exemptions. The Wet’suwet’en Nation is made up of five clans, each holding distinct territory. While an elected First Nation band council governs the reserve lands, the hereditary chiefs hold jurisdiction over the traditional territory of the Nation. While twenty band councils along the pipeline have signed an agreement with the company, what is legally significant is that the hereditary chiefs have not given the project their consent. The signed agreements between the First Nation band councils and TC Energy do not apply to the traditional territories which fall under the authority of the hereditary chiefs. All five Wet’suwet’en Nation clans oppose all pipeline proposals and do not provide free, prior, and informed consent (FPIC) to Coastal GasLink’s project. The Unist’ot’en camp was created in 2009 as a healing/learning centre and as a means of reoccupying Wet’suwet’en territory. On December 14, 2018, B.C. Supreme Court judge, Justice Marguerite Church, granted an interim injunction to Coastal GasLink against the Unist’ot’en camp which was preventing the start of pipeline construction. The camp was protected by checkpoints/blockades which were used to control access to Wet’suwet’en territory. On December 21st, 2018, the injunction was extended to include the Gidimt’en checkpoint and all LNG blockades south of Houston which were on Wet’suwet’en land. On January 7th, 2019, 14 people were arrested when the RCMP broke the gate of the Gidimt’en camp checkpoint and created a temporary exclusion zone preventing media and public from entering. Those arrested are alleging an inappropriate use of force from the RCMP and an internal review of police action is underway. The 1997 Delgamuukw Supreme Court case ruled that Wet’suwet’en title, based on traditional clan governance (not governed by the band council) has never been extinguished. While this case is important for establishing that Wet’suwet’en title is possible, the litigation needed to formally establish Wet’suwet’en jurisdiction and hereditary authority has not yet happened. By taking the position that a Supreme Court decision is required prior to respecting the territory of First Nations, Coastal GasLink, the RCMP, and the federal government endanger reconciliation by placing the burden of proof on Indigenous peoples to prove their legitimacy. 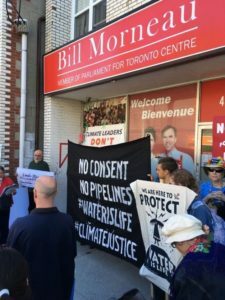 The creation of this new pipeline directly violates Canada’s international commitments to the United Nations Declaration on the Rights of Indigenous People (UN Declaration) which recognizes that the rights of Indigenous peoples are inherent. The view that rights do not exist until proven in Canadian courts goes against international law. In addition, to breaching the right to FPIC, this project breaches Article 10 of the UN Declaration which states that “Indigenous peoples shall not be forcibly removed from their lands or territories”. 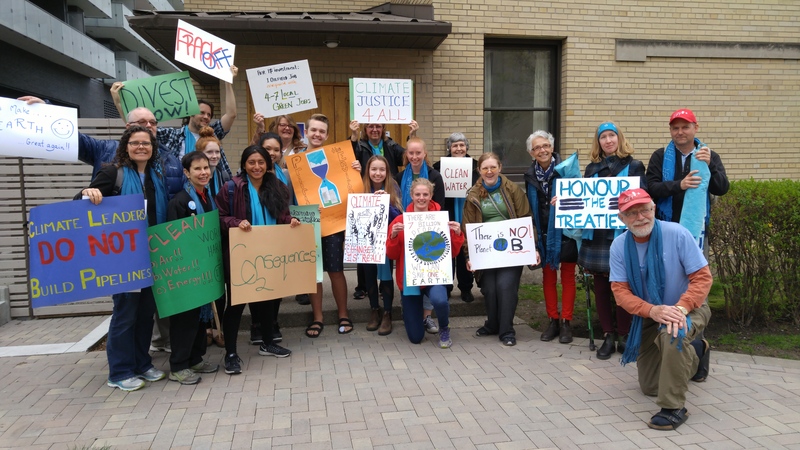 Contributing to these rights violations, the TC Energy project directly contradicts Canadian government commitments to the Paris Agreement and the goal of moving towards a clean economy future. To meet the provincial 2030 climate pollution reduction target, pollution must be reduced by more than 3% per year, or 24 million tonnes annually. The province calculates that the first phase of the pipeline project will cause 3.5 million tonnes of additional annual carbon pollution, however the Pembina Institute estimates that the pipeline and LNG plant will add double the provincial projection, 8.6 million tonnes of emissions. An honest assessment of the environmental costs including impacts on caribou migration, water contamination from fracking, methane leaks, and impacts of the transport of the LNG, has not been undertaken. This situation still needs support! Since the arrests in January, the hereditary chiefs and the RCMP have agreed on a temporary plan of action over the enforcement of the interim injunction. Pre-construction work is currently underway while Wet’suwet’en leaders continue to battle the decisions of the courts. The injunction order is being fought by Freda Huson and hereditary chief Smogelgem and the case should be heard in court in May. The Unisto’ten camp have put together a toolkit for supporting the Wet’suwet’en people available here. This resource provides educational resources for those interested in learning more, along with places to donate and ways to take direct action. 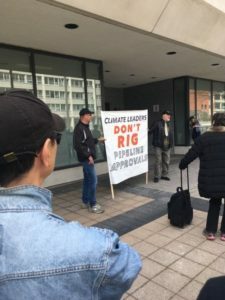 This pipeline goes against KAIROS’ advocacy goal calling for no further approvals of oil and gas development, including pipelines to export bitumen and LNG.